Students should expect to devote the following time per credit, per week for a 15-week semester. A period is 50-minutes or a minimum of 80 hours of on-the-job training with college supervision. 1 lecture credit equals 1 period with 2 hours of outside preparation. 1 laboratory or activity credit equals 2 to 4 periods and necessary outside preparation. 1 music studio credit equals 30 minutes of applied instruction plus three hours of practice per week. An equivalent amount of work is expected for internships, practicums, studio work, clinicals, independent study, compressed courses, and other academic work leading to the award of academic credit. The college removes students from academic probation who attain a semester grade point average that meets or exceeds the minimum requirements to be considered in good standing. Students who fail to achieve good standing after one semester on academic probation are subject to academic suspension. The college issues an academic suspension when a student fails to achieve good standing after one semester on academic probation or for academic dishonesty. Students on academic suspension may not register for academic courses for at least one semester unless they receive an approved petition for exception. Financial aid probation and suspensions are issued in accordance with the rules and regulations governing the form of aid received and are determined separately from academic probation and suspension. Current semester problems. Students having trouble with a course may withdraw from the course or the college (see schedule changes) audit the course (see Auditing Courses), or request an incomplete or in progress (see Incomplete and In Progress). All timelines must be met to make any changes. ​Academic standing. Academic standing is based on either semester grade point average or cumulative grade point average (see Academic Standing), thus allowing redemption in one semester regardless of past record and avoiding penalty for one below par semester in an otherwise satisfactory record. Academic Forgiveness. Degree-seeking students currently attending Casper College may petition the registrar to remove up to two semesters, in their entirety, from the calculation of the student’s cumulative grade point average (GPA) and degree credits. The registrar will approve a petition for students who have completed 24 semester credits of college level courses with a 2.5 GPA after the last semester listed on in the forgiveness petition. This is a one-time-only option. Your advisor is essential to your success. Be sure to meet with your advisor prior to enrolling for classes or making schedule changes. Students are assigned an advisor who has specific knowledge about their chosen program during new student advising and registration events. Students have the right to request a new advisor. Students who wish to change their advisor contact Enrollment Services. Students who want a specific advisor must obtain permission from that advisor and contact Enrollment Services to make the change. Help advisees develop realistic educational career plans. Assist advisees in planning a program of study consistent with abilities and interests. Assist with selecting courses and verify that prerequisites are met. Provide registration priority date and time. Monitor advisee’s progress toward educational and career goals. Discuss relationship between instructional programs and occupation/career goals. Approve educational transactions (e.g. schedule, drops, adds, withdrawals, change of major, waivers, removing academic holds, etc.). Maintain a file for each advisee. Refer students to appropriate resources and services. Request reassignment of advisee to another advisor, if necessary. Assist advisees in identifying career opportunities. Direct advisees to career counselors, if necessary. Share interests, goals, and educational and career plans. Report personal information that has a bearing on your academic success such as the number of hours working, family responsibilities, and financial aid status. Be familiar with the academic catalog and student handbook. Know your advisor’s advising hours and phone number. Schedule an appointment or meet during designated advising hours. Call if you are unable to keep an appointment. Meeting with your advisor is required before you can register. Keep a record of graduation requirements, which is your responsibility to fulfill. Keep correspondence from the college and meetings with your advisor(s). Know deadline dates listed in class schedules and Student Handbook. Contact the appropriate student support services when necessary. Prepare for meetings with your advisor, particularly when registering for classes. Have an idea about what courses you want to take for your program and electives. Have a list of alternative courses in case the courses you want are closed or waitlisted. Become familiar with how to use WebAdvisor or myCCinfo. Alert your advisor immediately of difficulties affecting your course work or continued enrollment. Provide Enrollment Services with your current address and phone number. Students are expected to attend all sessions of the classes in which they are enrolled. Students should contact the Vice President for Student Services Office in the Nolte Gateway Center or 307-268-2201 if they are called for jury duty, subpoenaed as a witness, or ill or injured and unable to attend class for an extended period. The office will notify instructors of students on extended leave. This notification does not give students an excused absence. Students should contact their instructors as soon as they are able to inform them of an absence. Instructors may request students provide appropriate documentation to the Vice President for Student Services Office upon their return and complete any make up work assigned. Contact the Vice President for Student Services Office at 307-268-2201 about documentation requirements. Students should check with their instructors about their class attendance policies. Casper College encourages its instructors to make a reasonable effort to allow students to observe their major religious holidays or to participate in college-sponsored activities without academic penalty. Students must notify their instructors as soon as possible of dates for which they plan to request an excused absence and abide by their instructor’s class policies. Instructors are required to report the names of students who attend class irregularly or are absent for several consecutive class sessions to the Vice President for Student Services Office, who will contact students about their intent to continue in the course. Excessive absences or tardiness may result in a lower grade or in a faculty-initiated withdrawal from the course. Automatic Withdrawal: Students who have not attended or participated in a course they are enrolled in during the first week of the semester will be automatically dropped from that course at the beginning of the second week. Contact your instructor if you have questions about automatic withdrawal. Instructor sponsors or coaches submit a list of students who will miss class because of a college-sponsored activity to the student’s faculty and to the vice president for student services at least three days before the first scheduled day to be gone. Students should talk with their instructors prior to any absences. The instructor may excuse absences and allow make-up work. Many students come to Casper College with a clear idea about what they want to accomplish while they are here; other students are undecided. Instructors can provide information about the areas in which they teach. The Enrollment Services/Student Success Center in the Nolte Gateway Center, third floor provides assistance by looking at different majors and how those translate into careers, creating academic and career timelines, and providing direction on how to declare a major and find a new academic advisor. Casper College offers certificates and associate’s degrees. It is important when choosing a major or career to know the differences between the programs we offer. Certificates usually take two semesters to finish and include only the courses directly relevant to the field. An associate of applied science degree is a good choice for students who want to earn a college degree and enter the workforce, but do not plan to pursue a bachelor’s degree. Students interested in pursuing a bachelor’s degree will want to select majors that lead to an associate of arts, associate of business, associate degree in nursing, or associate of science. These programs parallel the first two years of most bachelor degree programs. Casper College evaluates credit-bearing courses in which five or more students are enrolled. Near the end of the course meeting time, students will receive a link in their college email to an online evaluation for the course. Completing course evaluations assist instructors to improve their teaching. Student participation in course evaluations is highly encouraged. The information provided is anonymous. The college issues student grade reports twice a semester. The mid-term grades indicate the student’s academic progress part way through the semester and are not part of the student’s permanent record. Final semester grades are a part of the student’s permanent record. Students may view their grades online in WebAdvisor or myCCinfo. Students who think they received an incorrect grade should contact their instructor. Instructors may submit a Grade Change Form to Enrollment Services if there has been an error. Grades are eligible to be changed for up to one year from the date the grade was assigned. Grade Point Averages (GPA). There are two types of grade point averages (GPA): semester and cumulative. Semester GPA is calculated by multiplying the credits a course is worth by the number of points the earned grade is worth to give the total grade points for that course. Do this for each course taken in a semester. Add the points for all the courses taken that semester and divide by the total number of credits attempted for that semester. The cumulative GPA is calculated by dividing the total number of grade points earned at Casper College by the total number of semester credits earned. Incomplete. An incomplete (I) is awarded when a student, for reasons beyond the student’s control, is unable to finish the course and the student would otherwise have had a passing grade. A student who receives an incomplete must arrange with the instructor to complete the course. The student must submit a completed Incomplete Grade Contract to the Registrar’s Office. Audit. Students may audit a course when they want to attend a class but do not want to receive credit or a grade for that course. Students who wish to audit a course indicate so at the time of enrollment. Students who satisfactorily complete an audited course, including regular attendance, will receive an audit notation on their transcript. They will not receive credit or a grade. The college charges full tuition to audit a course. Withdraw/Drop. Students may drop a course at any time prior to the census date listed in the academic calendar (usually day 10 of the semester) using WebAdvisor, myCCinfo, or by going to Enrollment Services. Dropped courses are not recorded on a student’s transcript. Students may withdraw from courses after the census date in WebAdvisor, myCCinfo, or they may submit a completed Change Form to Enrollment Services prior to the withdrawal deadline listed on the academic calendar. Withdrawals are recorded on the student’s transcript as a withdrawn (W) course. After the withdraw deadline, a student may submit a completed petition with their instructor’s permission to Enrollment Services. Additional documentation may be requested, and approval is not guaranteed. Check the refund schedule for any applicable charges. Course load is measured in credits enrolled in each semester. Twelve credits is full-time enrollment. On average, a student will need to take a minimum of 16 credits to complete an associate’s degree within two years. The maximum recommended credit load is 19 credits per semester. Students should discuss their appropriate course loads with their academic advisors. The vice president for student services or an enrollment service director may grant an exception to this rule for student with a good academic record. Capstone Courses - The capstone course is usually the last class in a program of study. It represents a “crowning achievement” as a capstone does in architecture. A capstone course may require a project and/or presentation; an assessment exam to test interdisciplinary skills (like math, writing, critical thinking, etc.). A capstone may also involve a final research paper exploring a topic of interest, emerging from a student’s program of study. Ultimately, a capstone gives the student the opportunity to demonstrate knowledge and skills gained during the college career. Field Studies - A combination of classroom instruction with participation in the actual field being studied. Directed Studies/Research Problems - Special projects and research carried out under the direction of faculty. Independent Studies - A course designed and taken under a special contract with a faculty member. Special topics courses - Courses that are not part of the regular catalog curriculum. Designed to meet special needs or interests and provide flexibility in the curriculum to meet a variety of situations. Courses may be designed to meet the interests of a group of students, to fit the talents of a visiting professor, to study a current problem, or to meet similar educational situations. Special topics courses may be offered in any department and are normally semester-long courses for one to three credits with a max of 6 credits if different topics are offered. Special topics may also be offered, however, as short courses by visiting professors for one or two credits. Special topics courses offered are listed in the registration material for each semester. Credit for prior learning (CPL) is a process that enables students to demonstrate what they have learned and translate that learning into college credit. CPL validates college-level knowledge and competencies acquired through life, work, military experience, civic engagement, independent study, and professional development classes or training. It may be used to obtain credit for courses taken at another institution that did not transfer. Contact the Records Office with questions about CPL. Casper College offers students three ways to earn CPL: by exam, professional certification, or military training and experience. Academic departments may identify courses that students can earn credit for by taking an exam. Exams may be departmental, College Level Exam Program (CLEP), College Entrance Exam Board Advanced Placement Exam (AP), or International Baccalaureate (IB). Departmental Exam. Students who have experience, training, or noncredit coursework in a subject area may request a credit by exam. If the request is granted, departmental finstructor will develop an exam that corresponds with the outcomes, objectives, and rigor of the course and program. Exams may be written, oral, or a demonstration. CLEP. CLEP assesses proficiency through exams on business, composition and literature, world languages, history and social sciences, and science and mathematics. Most CLEP exams cover lower-level and introductory knowledge. AP. High schools administer AP exams to students who have taken an AP course. The test assesses student’s subject area knowledge. Casper College awards credits to students who pass an AP exam at the minimum level for a course approved for AP credit. IB. High schools administer IB exams to students who have taken an IB course. The test assesses student’s subject area knowledge. Casper College awards credits to students who pass an IB exam at the minimum level for courses approved for IB credit. The college may grant credit for professional certifications that directly correspond to a course. To receive credit, students must provide documentation of the certification that is current and valid to a an instructor in the area of study that corresponds with the certification. Upon acceptance of the certification, the instructor submits a request to issue CPL to their department chair or program director for approval. Upon approval, the request is submitted to the Records Office who records the credits. Students who have earned military education and training credit may apply for CPL. Casper College uses the American Council of Education’s (ACE) Guide to the Evaluation of Educational Experiences in the Armed Services to determine credit for military training and experience and ACE’s National Guide to College Credit for Workforce Training to determine credit in exceptional cases. The college reserves the right to make an independent determination of equivalency of courses or to require departmental exams and evaluations. The college will grant one semester credit for physical education to students who present a Report of Discharge (DD Form 214) to the Records Office establishing active duty of 181 days or more. Students who present such evidence for more than one year of active duty will be granted two semester credits. The veteran coordinator will request the Registrar’s Office complete a military transcript evaluation for students who requested a transcript evaluation on the Request for Certification form. The Registrar’s Office will evaluate transcripts for classes that could count for elective or general education credit. Students who would like their transcripts evaluated for specific course credits that could apply to their program of study must contact their advisors. Advisors will coordinate with the Records Office to review the transcripts to determine if there are any specific course credits eligible to apply towards a student’s program of study. The following are requirements of CPL at Casper College. Casper College awards CPL for coursework in disciplines related to its degree and certificate programs. Students must prove their knowledge and competencies in an area of study offered by the college. Students may only apply for CPL for courses applicable to curriculum requirements in the student’s declared program of study. Students must be registered as degree seeking and admitted into a specific program during the semester in which CPL is awarded. Students must submit official documentation of previous work or demonstrated competencies before CPL will be awarded. Students placed in a higher-level course, may earn CPL in lower-level courses by taking an approved exam. Any exams taken for CPL must be completed by midterm of the semester in which the student is enrolled in the higher-level course. CPL satisfies prerequisite requirements the same as coursework. Students who take AP or IB exams must score the minimum or above on each test to receive credit. They must request an official transcript from the College Board for AP exams or International Baccalaureate for an IB exam be sent to the Record’s Office, who makes the placement decision for AP and IB credit. Students who intend to use CPL in a course in which a grade has not been awarded to meet degree requirements at another institution should check the requirements of the receiving institution. The Records Office awards and records CPL. Credits are assigned but not a grade. Credit earned through CPL is not used to calculate grade point average. To earn a grade for a departmental exam, students must pass an assessment developed by a Casper College instructor with expertise in the subject area that corresponds to the published course outcomes. Students must pass all work assessed at 75% or a “C” level proficiency or better for all of the course outcomes and competencies. Casper College may accept CPL awarded by a regionally accredited institution with approval of the Records Office and the dean of the school in which a similar course would typically be offered. These credits have the same limitations in meeting graduation requirements as CPL earned at Casper College and will be used in computing the total credits of CPL for which a student is eligible. Regardless of the amount of CPL the college awards, degree-seeking students must earn at least 24 of the credits applied toward graduation through the completion of Casper College coursework. Students must complete 15 of the last 30 credits applied toward graduation as a degree-seeking student at Casper College. For certificate programs, 40% of the total required credits must be earned through Casper College coursework. No more than 40% of the total credits applied toward a degree or certificate may be awarded through CPL. Students who take a CLEP exam must pay a non-refundable third party vendor fee and a non-refundable college processing fee. Contact the Testing Center at 307-268-3850 or testing@caspercollege.edu for more information on fees. Students who take a departmental exam or earn CPL via a professional certification must pay a college processing fee to Accounting and Financial Management. Students requesting military education and training credit are not required to pay a processing fee. High schools administer AP and IB exams. Students should inquire with their respective high school for more information. Students who wish to appeal a CPL decision must follow the student grievance policy before the end of the semester in which the student requested CPL or the CPL exam was administered. The college will deny appeal requests made after the deadline. * – The essay portion of the test is required and will be scored by Casper College English Faculty. # – This credit will not meet the requirement for Wyoming Constitution. If credit is to be awarded the individual must pass the CLEP exam and the one credit Wyoming Constitution course. This still may not meet the requirements for the University of Wyoming. * This credit will not meet the requirements for Wyoming Constitution. *This credit will not meet the requirement for the Wyoming Constitution course. *Must have official transcript from International Baccalaureate Program. President’s Honor Roll: This honor is granted at the end of the fall and spring semesters to full time, degree-seeking students who completed at least 12 credits with a 3.5 or higher grade point average in the given semester. Dean’s Honor Roll: This honor is granted at the end of the fall and spring semesters to part-time, degree-seeking students who completed at least 6 but fewer than 12 credits and non-degree seeking students who completed 6 or more credits with a 3.5 or higher grade point average in the given semester. Graduate with Distinction: Students receiving associate’s degrees who have earned a minimum of 32 semester credits (semester credits attempted as defined in Grade Averages) at Casper College and have attained a cumulative GPA of 3.8 or better in Casper College coursework graduate with distinction. Lambda Epsilon Chi: A national honor society that recognizes excellence in legal assistant/paralegal studies. Phi Rho Pi: This national organization recognizes excellence in forensics competition and is open to students interested in competitive speaking. be enrolled in Casper College for at least six credits in the semester he or she becomes eligible for membership and is initiated. Moodle4Me is a Learning Management System (LMS) used in distance education classes and classes with a web component. At the beginning of each semester, Enrollment Services will email students enrolled in online courses information on how to get their username, pin (password), and directions for logging into Moodle4Me. Classes become accessible on the first day of school. To access Moodle4Me, go to https://www.caspercollege.edu/current-students. For technical assistance, contact the Digital Learning Center at www.caspercollege.edu/dlc. If a student repeats a Casper College course, the most recently completed course will be used to calculate the student’s cumulative grade point average. 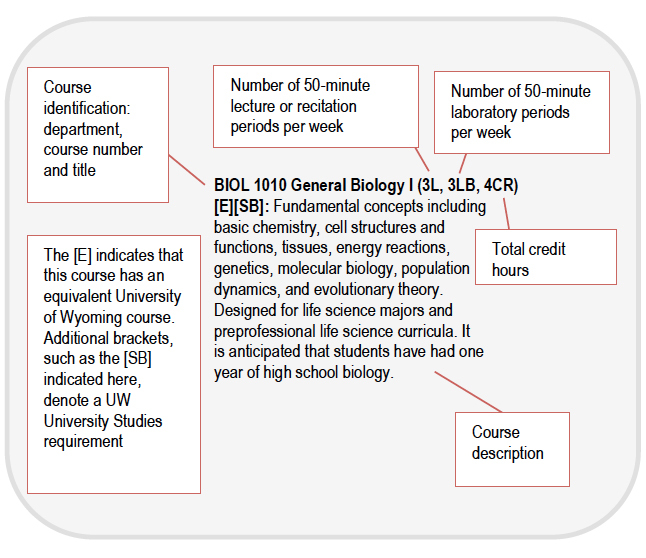 All attempts at a course are included on the student’s official transcripts. Repeated courses may be eligible for financial aid. A transcript is a record of the courses a student has taken. Students can download unofficial transcripts from WebAdvisor or myCCinfo at any time. Students may request official transcripts by completing the request application. No transcripts will be released until all administrative holds have been satisfied. There may be a charge for official transcripts. Your instructor will provide a syllabus, or you can locate it on the college’s website. Select “Current Students” on the homepage and then “Syllabi.” Choose the semester, course group, and section number for the course syllabus you are looking for. Syllabi for the current semester are not usually available until after the first week of classes. Your course syllabus will include information on grading, assignments, and other important course information. Students who plan to transfer to another college or university after they graduate, should select Casper College courses in accordance with the requirements of the schools to which they plan to transfer and consult with their transfer institution. Student Success Center professionals, who are located in the Nolte Gateway Center, third floor, are good resources for transfer information. The following suggestions may assist you with your transfer planning. Start planning for your transfer during your freshman year. Research in- and out-of-state colleges and universities to compare costs and programs. Request an academic catalog and admission materials from institutions you are considering. Select a transfer institution by the beginning of your sophomore year. Know admission, housing, and financial aid deadlines. Select Casper College classes that match your transfer institution’s requirements. Their academic catalog and your advisor can help with this process. Apply for admission. Allow enough time to complete additional requirements such as a written essay, portfolio of your work, or reference letters. Budget for application fees. Send a copy of your Casper College transcript with your application. Your transfer institution will need it to determine which credits will transfer. Contact the financial aid office at your transfer institution to inquire about available financial aid. Enrollment Services can help in this process. Arrange for housing early. Many college towns have housing shortages. Contact the housing office if you plan to live on campus. They may offer special housing arrangements for upper classmen including single rooms. Have your official Casper College transcript sent to your transfer institution after you have completed your last semester.